The Vanguard Way Blog has been started to complement the Vanguard Way official website: http://www.vanguardway.org.uk/ The Vanguard Way is a 66 mile, long distance footpath between East Croydon (South London) and the South Coast port of Newhaven. Primarily we hope to record interesting sightings along the Vanguard Way with an emphasis on flora and fauna and other 'natural' phenomena. To offer a contribution, please email vanguardwayblog@gmail.com We will be interested to receive details of what has been sighted, where and when, together with a photo if available. 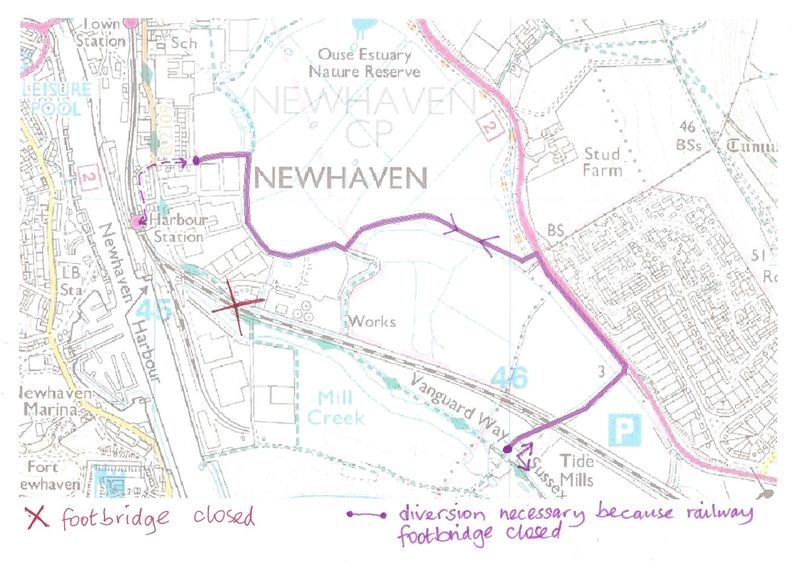 Don't worry about route diversions concerning the Newhaven railway footbridge, it's now open. Some lovely spring weather lately - lovely day for a walk! We have been notified that the footbridge used by the Vanguard Way near Newhaven Harbour station will be completely closed for around 2 months (from this week until the beginning of April). The contractor has now requested an extension to finish the work by Monday 4th April so the new Footbridge should be open on the 5th/6th April instead of the 2nd. The footbridge closure necessitates quite a big diversion for those using the Vanguard Way. Below is an annotated map of the area. The red cross shows where the Vanguard Way is blocked. The purple line shows the diversion. Below the map are the altered route descriptions which will hopefully soon be signed by the local authority. 10.9 At Tide Mills turn right along paved track inland across railway and to end at car park and the A26. Just before A26 turn left along shared use cycle/walking path some 5 metres away from A26. Follow for 200 metres and after the path bears left, another 40 metres, turn left along raised paved FP by seat and information board (faded). After FP does sweeping left bend and just after post (Ouse Estuary Nature Reserve) turn left off paved path onto grass and follows along tree line on left to locate FP along raised bank. Follow this which bends right with warehouses on the left and a rough area over to the right. As warehouses end and path bends right, turn left down the slope by allotment sheds and over Footbridge into recreational ground. Keep along left hand edge pass metal container and out on to Norton Road by entrance to Bevan Funnell Works. Where Norton Road meets Beach Road, cross over along Transit Road and follow to the end and Newhaven Harbour Station. A a) to e) From Newhaven Harbour station TL at small gate before station footbridge and follow Transit Road to end and where it meets Beach Road cross over into Norton Road. Follow to the end and bear left into recreational ground just before entrance to Bevan Funnell Works. Turn right along the field and go over a footbridge over stream, pass allotment sheds and up slope onto raised bank. Turn right along path and follow until reaching open area and post (Ouse Estuary Nature Reserve). Turn right along paved FP until it joins a shared use paved track by seat and information board (faded). Turn right and follow for 240 metres along side the A26 (some 5 metres away but slightly lower) until reaching car park and paved track. Turn right along track to pass across railway at two gates and onto Tide Mills. At cross path junction turn left to rejoin the VGW towards Seaford. We hope to provide further detailed information in due course and it will be incorporated into the main Vanguard Way website as soon as possible. This winter, in the British Isles, has been consistently warm, wet and windy. An unbelievable quantity of rain has fallen resulting in a succession of serious floods in Cumbria, Lancashire, Yorkshire, South Wales, Scotland... Here in the southeast our rainfall has been steady over the winter months and has resulted in gradual saturation making walking on country paths difficult and unpredictable. So far as conditions on the Vanguard Way go, any period of rain or wind will now be causing local problems of mud and flood together with fallen branches/trees. 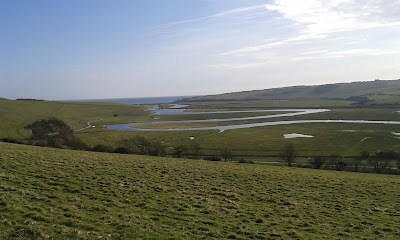 At the far south of the route last week there were problems with flooding in Alfriston and along the Cuckmere valley. Coupled with high tides the risk of disruption of a planned walk along the southern part of the Vanguard Way is high. Elsewhere conditions will be challenging until there is a significant dry spell because the ground water levels are so high. This weekend we have had a bit of a change of weather in that the unseasonable warmth has given way to much cooler temperatures and, in the case of Oxted, some snow! We took the opportunity of doing a short loop from Oxted, over the M25 via the footbridge to the section of Vanguard Way which 'shares' the route with the North Downs Way along the foot of the Downs and across the Greenwich Meridian. 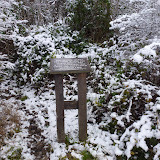 (Note our shared plaque with the North Downs Way at that point). Our snow was the sticky variety and trees and bushes had been picked out with a coating of snow. Oak trees are easy to spot with their contorted skeletons. As we neared the M25 footbridge Oxted Downs came into view - not quite enough snow for the children to have made it over to these slopes with their toboggans this time. Or perhaps 'health and safety' has prevailed as there were always a crop of broken collar bones and ankles from these rather 'black run' slopes. Temperatures were close to freezing and snow was falling off trees and bushes as our walk progressed. The going was very soft, especially on the fields along the link path where your boots were constantly needing to be tugged from the muddy grasp below the snow. These fields are generally damp so it is expected that the situation will be worse than usual. On the look out for wildlife footprints, we were only rewarded with small rabbit prints and dogs (or possibly foxes). Different types of tree looked quite different with their snow cloaks - the long buds of beech, the thorns of blackthorn and the keys of ash holding onto bigger clumps of snow. The edge of one of the cereal fields had not been harvested, possibly to provide winter food for wildlife, the 'ears of corn' looking very attractive with their snowy adornments. At the end of the fields the Vanguard Way parts from the North Downs way and descends towards Pitchfont Farm and Titsey. Here it appeared to be snowing but the falling snow was actually coming off the branches above as the thaw set in. Currently there are two sets of information, - changes to details in route descriptions and the companion and also a warning about future rail improvement works on the Oxted to Uckfield Southern Railway Line. N-S Section 4, 4.3/4.4; S-N Section G, G(4.6/4.5)The links with the Wheatsheaf pub and Lingfield Station have been replaced by a new link to pubs in Dormansland and Dormans Station, fully described in the revised route instructions for these sections which are now available on the website. N-S Section 4, 4.17d; S-N Section G, G(5.1a). The Foresters Arms pub is now permanently closed. N-S Section 5, 5.1 a; S-N Section F, F(5.2e). The Foresters Arms pub is now permanently closed. This section starts (N-S) or finishes (S-N) at the junction of B2110 Hartfield Road and Station Road. N-S Section 7, 8.1a; S-N Section D, D(8.1) (link from Golden Cross pub). The Golden Cross pub is now permanently closed. N-S Section 8, 8.1; S-N Section C, C(8.1) (link to Golden Cross pub). The Golden Cross pub is now permanently closed. N-S Section 9, 9.9 a; S-N Section B, B(9.12e). Alfriston Youth Hostel has closed. Marsh Green. The Wheatsheaf pub has closed. Forest Row. The Foresters Arms pub has closed. Poundgate. The phone number of the Crow & Gate pub is now 01892 603461. Blackboys. The Glade hostel has closed. Golden Cross. The Golden Cross Inn has closed. Litlington. 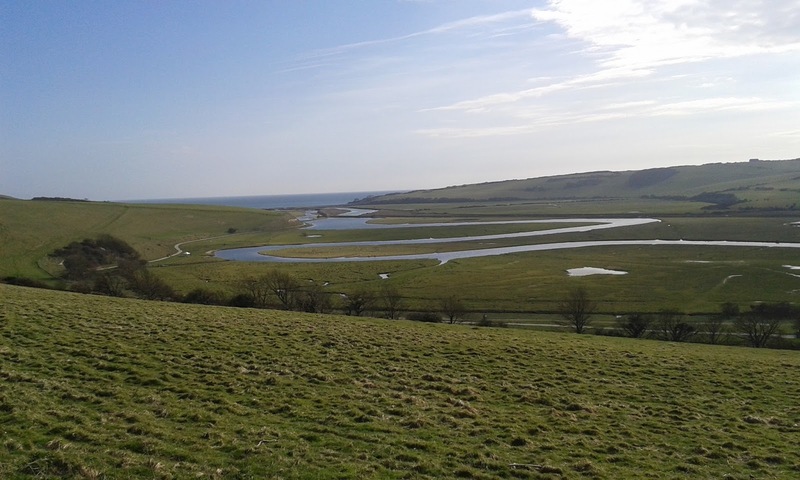 Alfriston Youth Hostel has closed. We would like to make walkers aware of issues coming up in November if they are planning to use trains. If you scroll to the end of this post, you will find the link to the Southern Railway website. Briefly walkers wishing to do any stage from Oxted to Uckfield during November, should note that, due to Network Rail lengthening platforms at stations along this section and no doubt other engineering works, between Monday 2nd Nov and Friday 27th Nov, buses replace trains on most days except for the peak periods. There are also some weekend closures from Oxted to East Grinstead during the same period. All Mondays to Fridays between 09.20 and 16.40 the line will be closed between Hurst Green and Uckfield with rail replacement buses in operation. In addition on Sunday 8th there will be buses between Purley and Oxted for trains from Oxted on both Uckfeld and East Grinstead lines. On Saturday 14th and Sunday 15th the lines will be closed between Hurst Green and Uckfield and also East Grinstead. There is also closures on the Sussex east coast line around the Lewes area which will affect any walkers using trains to do the Berwick/Newhaven sections. Not many more 50th anniversary sectors of the Vanguard Way remain now. For further details check back to the 6th of April post please. At the end of July we walked from Poundgate to Blackboys. It was another glorious day of fabulous views and beautiful countryside - not to forget the good company of course. Everything in the way of plant-life, seemed to be fully grown with seeds and fruits already in evidence. Animal-wise we were lucky to catch sight of a young deer. Birds were heard but not seen too much and beetles were about. This time the photos are in a slide show for you. If you would like direct access to the web album click on the little square below. Those of you who still have a copy of the paper version of the Vanguard Way, 3rd edition, will recognise this view of High Hurstwood Church. We had chosen a day that was forecast to be fine with some sunshine but we had gentle rain on and off and, as it was quite humid, the rain was refreshing. We are in mid-summer; the trees are in full, heavy leaf cover, fruits are forming and in the air there is an autumn expectation. Summer has been achieved. I hear, “See, this is what you have been waiting for, there are no more surprises, now be prepared for the autumn”. We had our just desserts, having started from home early (ish) and walked through Croydon’s suburbs, minding the trams as we crossed their tracks arriving at Coombe Wood Café and what a delight that was. The flower beds were colourful and obviously well-looked after, the pond full of fish. Then it was onward, upwards and into the woods. Later we would be achieving the dizzy height of 260 metres, which is the highest point on the VGW. Our minds still on food we noticed two fruiting apple trees, neither with fruit ready for scrumping yet. The ash trees were full of bunches of seeds ready for wind distribution and the berries on the rowan trees were turning red. Below hazel trees were unripe hazel cobs, probably torn off by impatient squirrels of which we saw many scampering among the branches. The ground beneath the sweet chestnut was strewn with the dangly bracts. I am just going to encroach on Another’s column here, beer can be made from sweet chestnuts and is still produced in Corsica. China and Korea supply 55% of the chestnuts that we eat in the autumn and winter, perhaps roasting or as a stuffing. In the hedges, elderberries are formed but not yet ripe and black; old man’s beard has clambered over all the shrubs and is just opening its flower. These hedges will be white with it when they are fully open. Blackberries have quite a long season; there will be some ready to pick right now (pick those above waist height) but there are still pretty pink flowers waiting for pollination. Once October comes, though, the devil is in the berries so should not be picked! Blackthorn trees are ripening their sloes and will be ready to be picked in the autumn for the making of sloe gin. My experience from taking part in a sloe gin competition back in January, tells me to buy the best gin that I can afford which will give a smooth velvety liqueur. Rose hips are forming; I have no experience of making a syrup with these. We saw plenty of rabbits and heard buzzards but could not see them in the air. Along one footpath we flushed out a brood of young pheasants which fought to get through a fence to escape from us. In the short grass on the long path towards the microwave relay station, we raised moths and butterflies, perhaps the chalkhill blue being one. Amongst the grass were vetch, wild thyme and red clover and obviously attractive to butterflies. Dainty pink and white striped bindweed threaded its way through the grass, but was not appreciated by the gardeners among us. This is horse country and as we descended from Nore Hill we could clearly hear a riding lesson being given. Yellow-wort stood tall (100-140mm) in the short grass of these fields. The yellow flowers open eight petals which is unique in the Gentian family flowering in Britain, four or five being the norm. Their pointed green-grey leaves are joined by their bases to form a collar around the stem. The cows were taking it easy lying down in this beautiful valley, they must have known that rain was on its way. Twice along the way we came across large Roman snails. Their shell is light brown with dark spiral bands and their shell is about 50mm diameter. 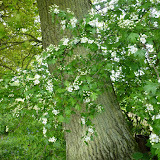 They were introduced to southern England and are now established in a few woodlands mainly on chalk. You certainly don’t want this guzzler in your garden! You may search the skies for a landmark as you reach Nore Hill Chalk Pinnacle but you would be looking in the wrong direction. Look for a fenced depression in the ground towards the top of the hill and having read the helpful information, look for a small pinnacle below ground level now very much covered in foliage. This is the last of the natural pinnacles that were to be found submerged on this Regionally Important Geological Site (RIGS). The corn has been harvested in the fields on the North Downs and the straw has been baled into huge cylindrical shapes. In land set aside I saw poppies, oxeye daisies and thistles. Now we could see journey’s end, Oxted and a refreshing drink awaiting us just beyond the M25. Another group set off from Haxted Mill to Poundgate last weekend too. They weren't so fortunate with the weather!. The photos below are in the Haxted Area. First is of new bullrush flowers at Gabriel's Fishery. 2nd is of a vetch I haven't identified yet and 3rd of a pill box in the 1st field south of Haxted Mill. How time flies! The next opportunity to walk the Vanguard Way with the Vanguards in their 50th anniversary year is on Saturday 25th July. Just 9 miles between Poundgate and Blackboys. For further details please see the April 6th post, just keep scrolling down. 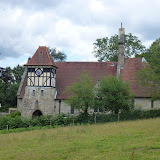 At the end of June we walked from Forest Row to Poundgate with a contingent preferring to walk to Forest Row from East Grinstead along the cycle way which follows a dis-used railway track. As this Saturday was at the beginning of our heatwave, it was pleasant to walk along the shady tree lined cycle route following embankments and cuttings. This link starts in East Grinstead and passes up through the old town centre. Preparations were well advanced for East Grinstead in bloom and Armed Forces Day. 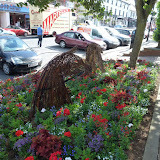 Our first 'flora and fauna' involved bedding plants and softly sculpted race horse heads. View into the cool depths of the cutting beside the embankment. Once the breakaway group reached Forest Row we were joined by a significantly larger group who had arrived on the bus from East Grinstead. It was a special occasions for the Vanguards as we had been joined by our rambling 'cousins', Geoff's Jaunters. Together we headed up into Ashdown Forest for fabulous views and lunch at the Hatch Inn. Some people think this is the 'best' section of the Vanguard Way, certainly the conditions and company on this outing did not disappoint! As ever 'fauna' of the wild variety was not easy to spot but a deer was seen by some. After lunch we ascended to Gill's Lap, a favourite viewpoint on Ashdown forest. There is a new (to me) grazing area below Gill's Lap where some little black sheep are busy clearing the land for us. Onwards and upwards we arrived at Gill's Lap via the Hefalump Trap. Of course no Hefalumps to be seen but you never know up in Winnie the Pooh Land. (See the notice board at Gills Lap car park if you want to visit other Winnie the Pooh places of interest). From this area of the Ashdown Forest, in good visibility, you can see back to the Oxted Chalk Pit and so the Oxted Downs we have already walked down. Once you've arrived at the Kings Standing Clump area you can see the South Downs - our destination after another 2+ days of walking. 2015 has been an extraordinarily good year for roses so far and the wild roses in the hedgerows are super too. When we arrived at Kings Standing car park we were pleased to find the ice cream van as we had been out in the sun for some time by then. This car park has the most reliable ice cream van we know of and it can usually be found there even in colder and wetter times of year. Ashdown Forest is a Forest in the Norman sense - for hunting - as explained by Tony Robinson in his 'Walking through History' series. Co-incidentally his 'Walking the Tudor Way' programme (channel 4, Wildfire tv) was screened the same weekend. He walked the Vanguard Way from the Hatch Inn to Kings Standing Clump and described the medieval conflict where the profitable iron ore smelting business was trying to expand into the Ashdown Forest which was a Royal hunting area surrounded by a ditch, mound and pallisade fence renewed by Henry 8th at the time. The iron-ore smelting had to be kept 'beyond the pale'. Kings Standing may have been the site of a hunting lodge or a viewing stand of some sort. If you can find this programme again to watch, do! He makes his way onto Blackboys (for beer) which is our next destination. There are more photos taken on our walk in the associated Picasa Web Album. Captions should explain more items of interest. Click through to Picasa and run the slide show. Lurking at the end of the web album are photos taken this morning in Limpsfield Common Woods a mere few yards from the Vanguard Way. A new community of 'dwellings' has sprung up in the woods behind Ridlands Lane Car park and the nearest on is Peter Rabbit's Post Office across the field to the west of point 2.15 on the Vanguard Way. More Beatrix Potter than A A Milne... Check it out on the map in case you would like a diversion! 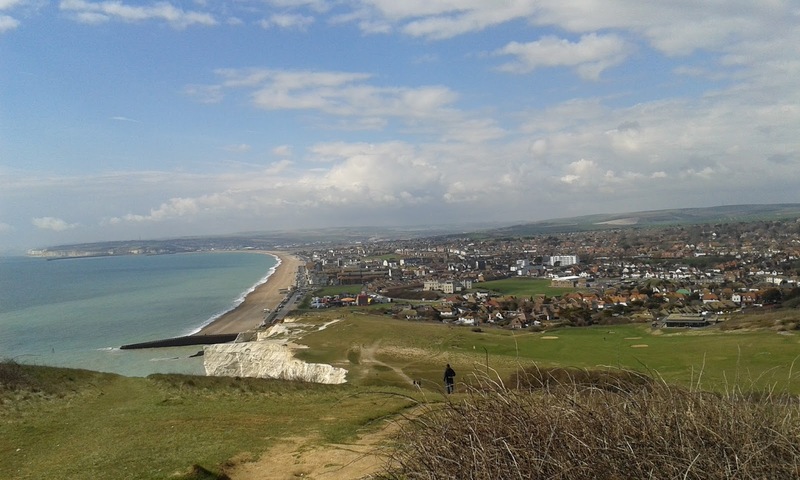 Look back to April 6th post, Our Golden Spring, for the programme of the remaining 50th Anniversary walks with the Vanguards. The next section of our Golden Vanguard Way walks was from Edenbridge to Forest Row - we have photos taken with a 2 1/2 week interval. It is still the 'Merry Month of May' and the May (Hawthorn) flowers are now well out. On the link from Edenbridge buttercups are providing a colourful carpet. Alien species are on show - Rhododendrons of varying hues in particular. They look exotic and brighten up many a spring garden but they are difficult to control once they've 'escaped' into the wild. Spanish bluebells don't seem to be threatening our area too much but we did find this clump near Starborough Castle. Again, they are big and bright in gardens but a threat to our native species as they cross breed. The native bluebells look more delicate and the flower stem bends over because there are no flower heads up one side of the stem. The Spanish ones have flowers all round the stem and the flower is upright. Otherwise bluebells are still evident but the flowers are going to seed and other vegetation is growing up around them. In particular stinging nettles are making a lot of growth. Not the best of news for ramblers but many butterfly species' caterpillars depend on them as food plants so they're not all bad. We spotted a hairy caterpillar which may be that of a small tortoiseshell butterfly - these caterpillars feed on stinging nettles. There was also a shrub/tree with several caterpillar 'nests'. This time the caterpillars were smooth and much smaller. They look like the caterpillars that frequently infest my cabbage plants but are on the wrong 'foodplant'. I forgot to mention that we spotted a buzzard on the previous walk between Oxted and Edenbridge. This time we saw a green woodpecker - though they always look more yellow than green and are often seen searching for food in grassland rather than pecking in woods. Robins were very busy with beaks full of small creatures and blackbirds noisy with their alarm calls. As the Vanguard Way gets further from urban areas, a walker can catch many glimpses of lovely buildings. The next opportunity to 'Walk the Vanguard Way with the Vanguards in their 50th anniversary year is on Saturday, 27th June. For details see the 6th of April Post - 'Our Golden Spring'. From the lane look left over the fields to see the Ashdown Forest appearing as a faint blue line on the far horizon. We will be there on the next leg of the walk! If you would like to view these photos and others taken on this route section, please click on the album below. Clicking through to Picasa will enable you to run a slide show with captions to the photos. Look out for the orchid and other items of intrigue. Our Vanguard Way blog has been set up by members of the Vanguard Rambling Club to gather details of interesting items of nature, spotted by users of the Vanguard Way anywhere along its length, including link routes. All material copyright Vanguards Rambling Club unless otherwise acknowledged. Watermark theme. Powered by Blogger.